I’ve actually been making progress on these. As I know I’ve said about this pattern before, even looking at the (yellow) sample project on the pattern, I’ve always known they have to be apple green. This in-progress picture leaves me feeling completely vindicated in that. 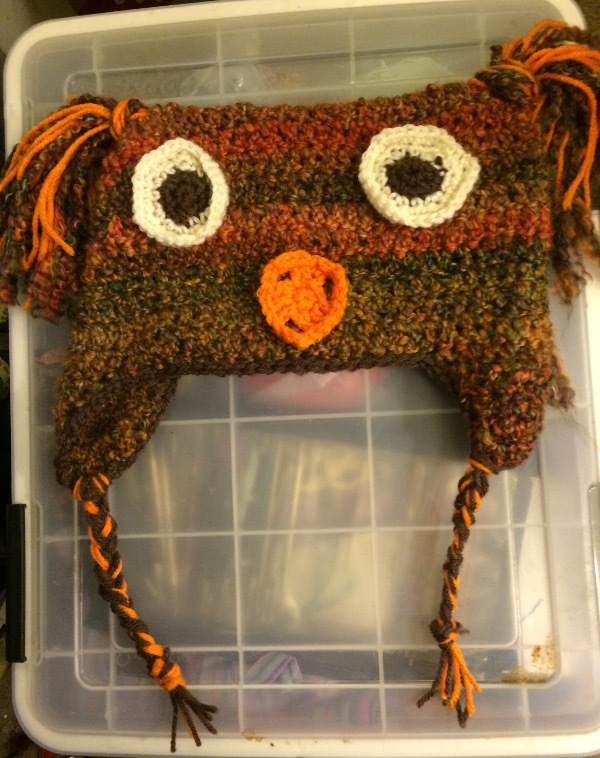 This project has been on the needles for 1 year and 11 months (as of yesterday). It’s spent a long time in and out of hibernation, for absolutely no reason pertaining to the pattern, or the yarn, or anything other than my own being distracted by other projects. 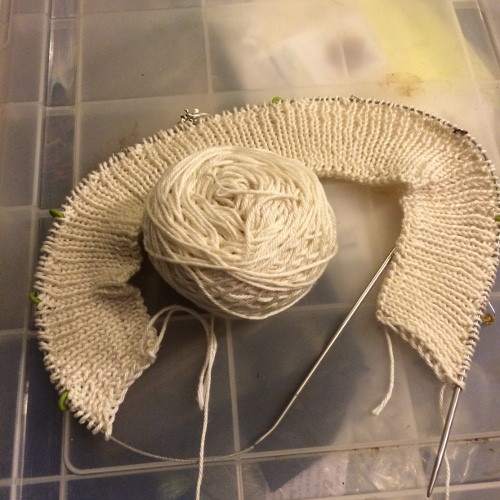 I enjoy it a great deal when I do work on it, and it actually knits up fairly quickly when I am working on it. Change to a bigger needle and keep knitting (longer sock, hopefully not crazy tight). Such are the trials of a big-girl knitter. 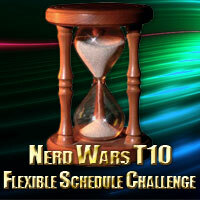 I’ll let you know what I decide and when, because I’m still rotating through other projects. Abby gave me a Kindle for my birthday! I absolutely love it. I love it so much I’m knitting it it’s very own sweater. I’m using Sharon Fuller’s “Ex Libris” pattern from “Stitching in the Stacks“. Which means I’m (slowly) learning duplicate stitch. I expect that I’ll be comfortable with the stitch somewhere in the middle of the typography, and it will probably show, but I don’t mind that. It’s for me, not for a gift, so it’s OK if it looks a bit wonky. Yes, you’re seeing that right. At this stage in construction the doll (Wee Fairy Bluebell by Melissa Mall) stands up by herself! I’m very impressed. The pattern is from Inner Child Crochet. It was one of a series of patterns I downloaded from them when I won 9 free download codes (back in 2014). 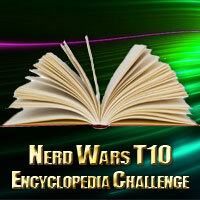 This is a reminder to myself that I should start entering blog contests again. This particular doll will be a big sister present for my niece when my nephew is born, which will happen sooner rather than later. This hedgehog (called Prickles, pattern by Emily Wolowiec) will be going to her younger sister on the same occasion. This might possibly be the cutest thing I’ve ever knit. I was still crafting throughout the long dry spell, and I have had had other things to blog about since I started posting again, so this seemed like a good time to join in Paula’s WiP Wednesday push (as started on the Tangled Mess blog). Depending on how this goes I might join in FO Fridays as well. I always have a pair of socks on my needles. In particular, it seems that I always have this pair of socks on my needles. I started them in July of last year, they’re toe up and I haven’t reached the heel turn yet. I’m generally a slow sock knitter for whatever reason, and this pair is not ‘mindless knitting’, so it’s been a row now and again. Slow going or not, I do like these. Clover Hill Yarn Shop: I picked up a skein of Hikoo by Skacel Abracadabra. This is a photosensitive yarn. 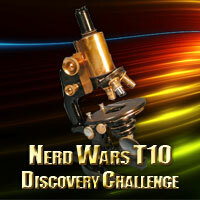 Mine turns pink in sunlight and, as soon as I had it, I had the idea of the theme project for my crawl. All About Yarn: This is my LYS. I grabbed a skein of Berroco Linus (which is a ribbon yarn) in a color very similar to the Abracadabra when it’s not in sunlight. The texture is very different. Lovelyarns: I got a skein of JoJoland Tonic in an amazing blue. The Knitting Boutique: One skein of Kraemer Yarns Perfection in the sand colorway. Have you guessed the project? 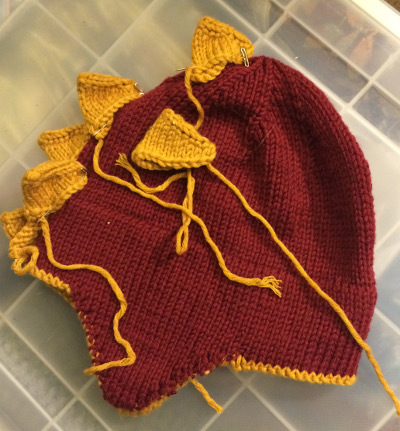 This pattern has been one of my Ravelry favorites for a long time, so when my friend Kay asked if I had any suggestions for a Guinan costume it came to mind immediately. It turns out that Kay didn’t think she had time to finish it before the event, so I told her I’d gladly do the work in exchange for the pattern, so it’s a win-win. It’s also my 200th Ravelry project. The construction on this one is interesting. I used split ring stitch markers to keep four strands of yarn ‘live’ at a time. My one spinning WiP is using the Millers Fire colorway from Alpaca Joy on a mini destiny spindle from Snyders Spindles. September was rather a crazy month for us. I’m not going to go into too much detail, but we saw Abby safely off to her Peace Corps staging, and waited breathlessly to learn that she’s arrived safely in Senegal. 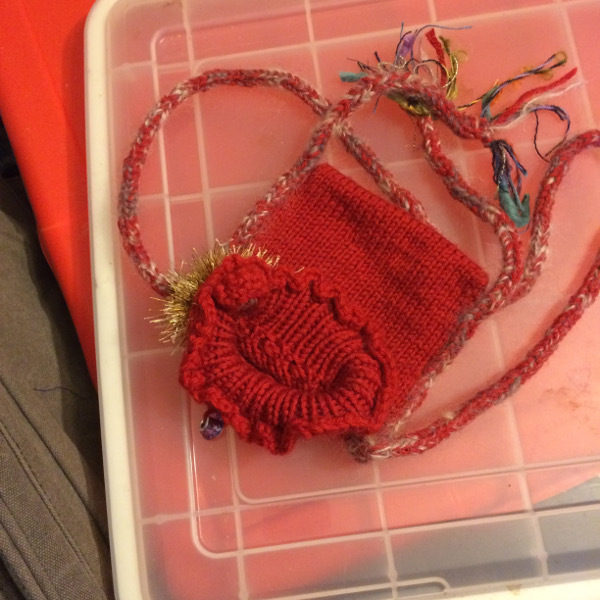 It still churns up all sorts of different emotions to think about it, so I’m just going to get back to blogging about knitting. It’s been a month since I’ve posted, so here goes. It was a stashbuster project. I used diadem (leftover from the Win Either Way cowl) and Pagewood Farm Denali sock yarn (left over from the Wayfarer shawl) on the outside, and Old Maiden Aunt laceweight (from the Bigger on the Inside shawl) for the lining. As you can see the color values are very close to each other. If I knit this one again I’ll go for something which pops a bit more, but I’m still pleased with this one. The Mont Royal socks are just starting to come together. The cricket sweater for my husband is coming along, but slowly. I haven’t gotten to the armholes yet. Since I’m working it in pieces that means very slowly indeed. 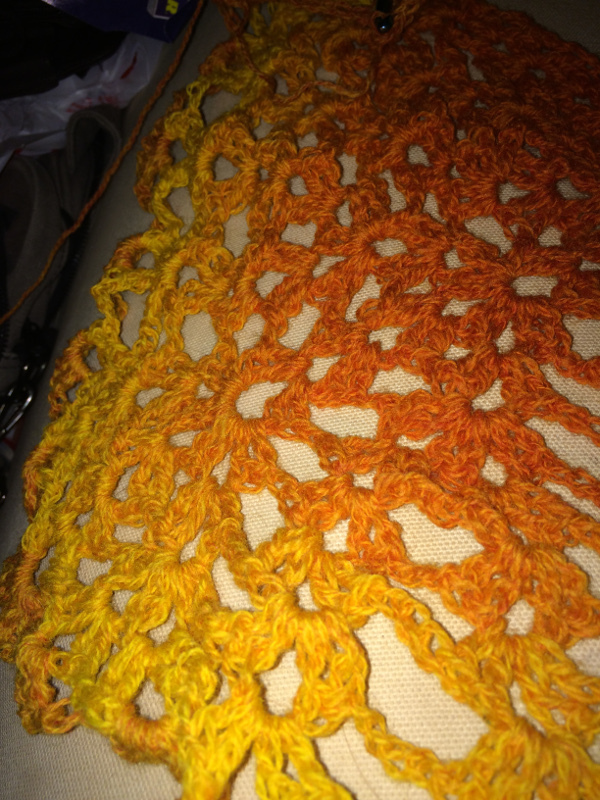 I’ve cast on another shawl. This one is Illustriation, by Wooly Thoughts. It’s a fun striped and textured shawl, which does the standard Illusion thing of looking different depending on the angle of observation. Shades of purple for this one. 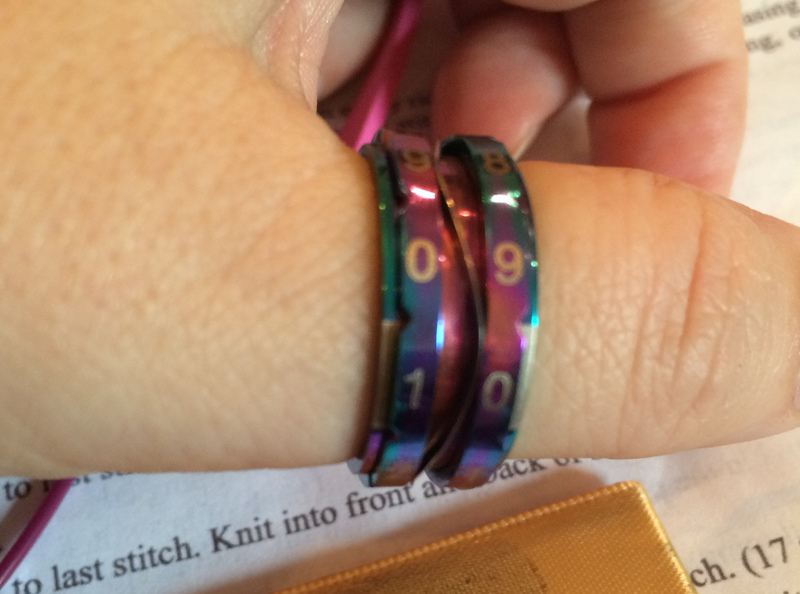 It’s made by a CritSuccess, which is a high end RPG supply company, the other rings they sell are dice. How cool is that?! 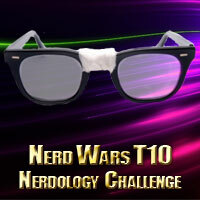 (watch for them on Geek and Sundry this holiday season!). I really cannot fangirl enough about this. So, yeah. That was my September. Hopefully I’ll do better about sharing October as it unfolds. I finished the felted handbag using mohair from Flying Goat Farm. I ran out of the darker brown just as I got to the handle break, so I switched to the orange there. 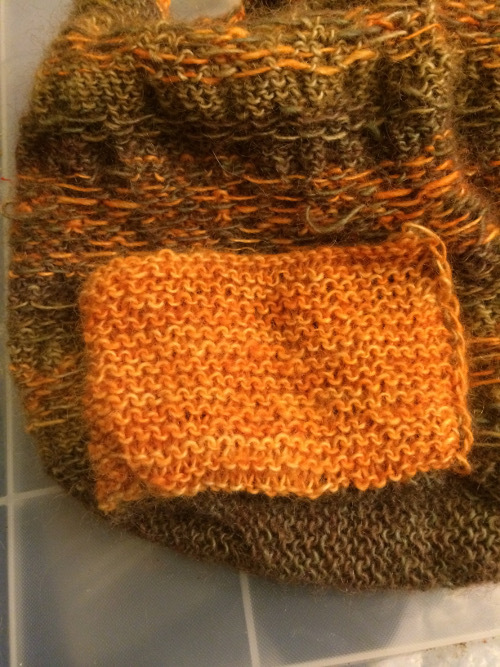 I had a bit of orange left over, which I used to make a knit-in (garter stitch) interior pocket. I didn’t have quite enough to make it a good cel phone pocket, but it’ll be good for something, I’m sure. 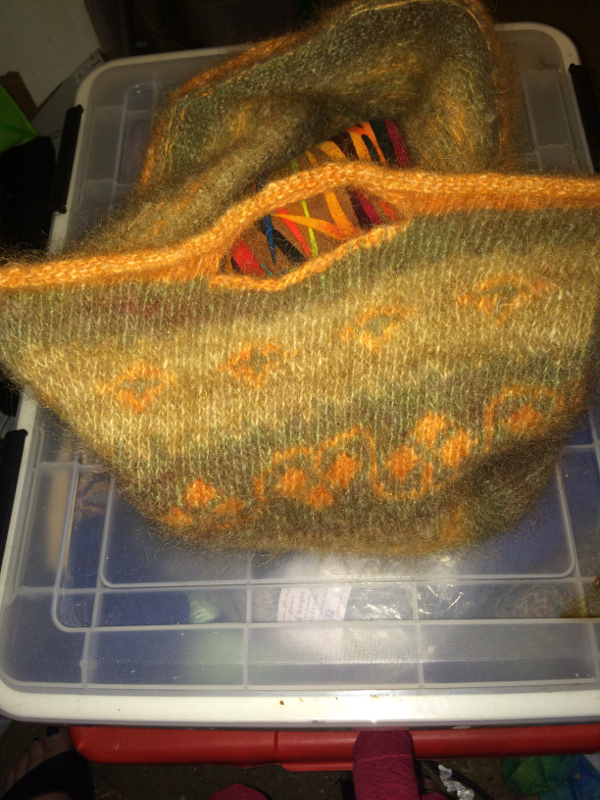 The bag (pre felting) was a little bit lumpy and awkward, but I was sure it was going to turn out nicely. Yeah, I know, if I was more consistent in my tension I wouldn’t have this much unevenness. 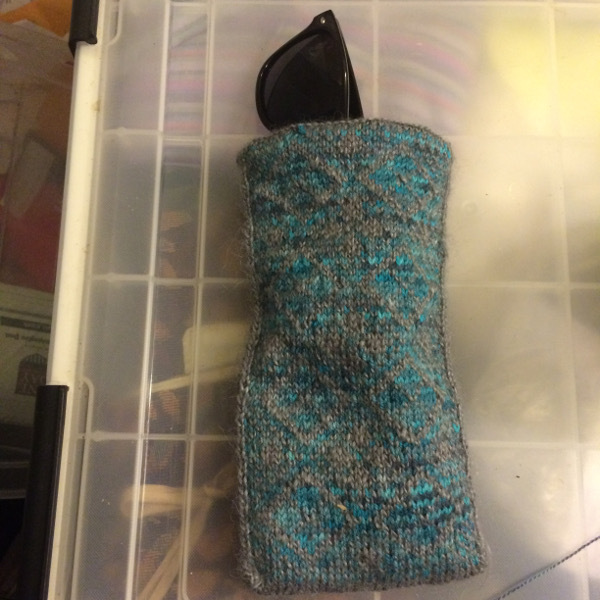 BUT – I kept my floats short (see pocket picture above) and felting is a really forgiving process. I’m very happy with the result. At some point I plan to seam up the swatch ans turn it into a change purse, but other than that it’s good to go! These are slow going, mostly because 1) I’m working on four projects and 2) they’re not mindless. 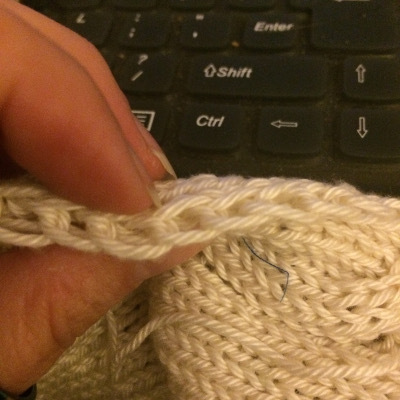 This picture clearly shows the downside of the asymmetric toes – the stitch pattern is totally centered in the base pattern. It doesn’t bug me enough to frog and re-knit, but it’s worth remembering for the next pair. Anyway, the pattern is lovely, the CoBaSi yarn is doing the right thing, I’m happy with these, even if they won’t be done until (at this rate) mid – fall or so. 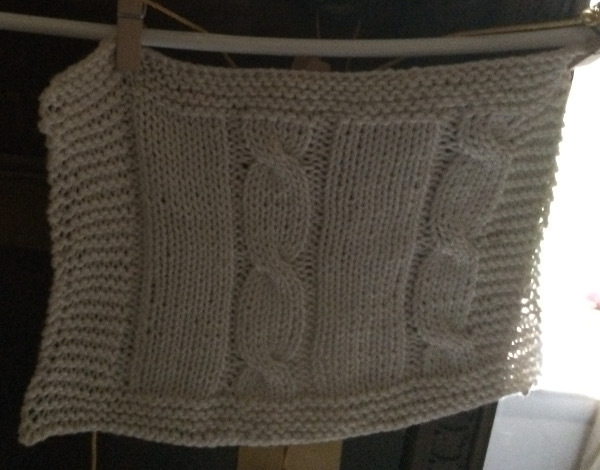 Because it’s cotton I not only blocked the swatch, I hung it overnight before re-measuring it. Yes, with cotton it really does grow and stretch with blocking and hanging. About a 10% vertical difference, enough that I know to knit it just a tad short. Not only did I get valuable information, I can use the swatch as a dishcloth (but I’ll hold onto it until the sweater is pieced and finished, just in case). Casting onto a large project (like a sweater) always intimidates me a little, so I placed a marker every twenty stitches during the cast on, and double counted those stitches, to make sure I had the right stitch count. I’m not sure how much time it saved over double and triple counting the stitches straight off would have taken, but it did lower my anxiety level about the whole process. This sweater is the Cricket Jumper from Joy Gammon’s The Doctor Who Pattern Book, because Five is his Doctor. You will notice it runs over $30 on Amazon, but I managed it for about $15 on eBay. I’ve been looking on and off for this book for years, and it looks to be worth the search. Joy Gammon did a lot of media fandom pattern writing in the 1980’s in particular, and the patterns are great (I’m so tempted by the K9 bag! ), but she was basically writing with the target audience of not-necessarily-skilled costume and toy makers, so I read over the pattern with an eye for adapting. 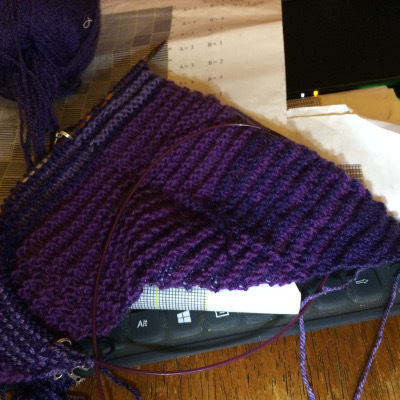 The most needed change was size (I had to extrapolate one size beyond the pattern). I also added a slip stitch selvage. A little reading convinced me that the classic cricket jumper (which would be what Davison wore) would be knit flat in cotton, so that’s the way I’m making the sweater. I expect this to be done by mid to late fall, because it’s a big project and because I’m working on three others. There was a little bit of calculating to make sure the cables were properly centered with the new stitch count, but I don’t expect any serious hick ups. I used my LYS’s ‘customer loyalty’ discount for this one, but even if I hadn’t buying the yarn would still have been less than I’d pay for a decent cricket jumper off the rack. I’m making a case for my sunglasses. Once again, I’m knitting a pattern from Stiching in the Stacks. This time I’m making a case for my sunglasses. It’s a simple enough idea – two color outer case, change yarns and purl (or was that the other way around) and keep knitting for the lining. Close it up and there’s a lined case. It’s a small piece, but I’m just planning to have it finished by next summer. The colorwork is pretty, but it’s not TV knitting. So while I was at Ocean City (watching the beautiful sunrises) I bought a lovely orange-red sundress. It’s pretty and floaty… and I don’t have anything to accessorize it with. Fortunately, it was always my plan to stop by Salty Yarns. 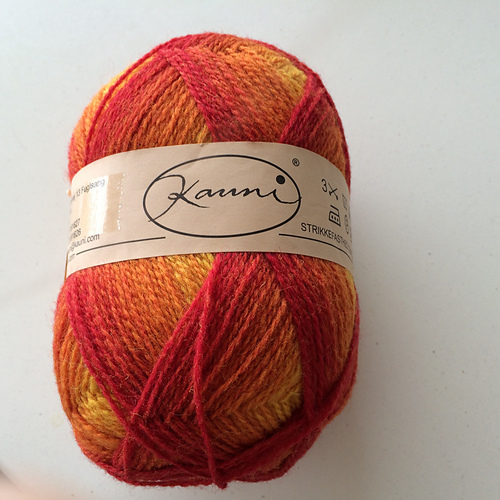 Yes, they are a needlework shop, but they have a nice little room full of knitting yarn, including this skein of Kauni. It coordinates with the dress, and it looks very sunrise like. I’m using the pattern I Promise You Pineapples by Justyna Kacprzak (it’s a free Ravelry download). I’m liking the effect very much so far. In fact, with the colors and the title of the pattern and the whole sunrise thing I just had to call it Pineapple Sunrise. 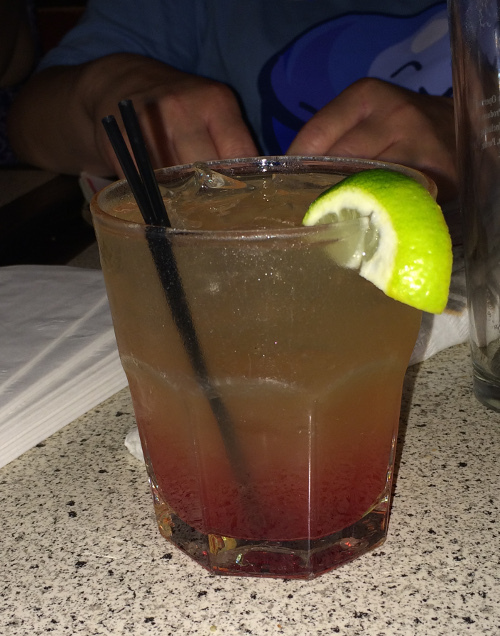 Then I asked my local bartender to make me a Tequila Sunrise with pineapple juice instead of orange juice. It was beautiful and tasty both! I didn’t win the fabric from Marshall Drygoods, or the One Skein Wonder book from Lisa Bogart. No new giveaways this time. *Apologies for pedantry, but I can’t make myself not say that the superstition probably has a lot to do with the length of time it takes to knit a sweater vs the length of an average romantic relationship. I just can’t make myself believe that it’s anything more than that, but still, folklore is fun! I have finished my “secret” project, and gifted it to my friend. This is a Snatchel. It’s a delightfully ‘naughty’ project from the Anticraft, which is always full of delightfully naughty. I made it for a friend who is recovering from a hysterectomy, and put a bottle of Fireball, because, hey, everyone needs fireball. I think she’ll be using it for a dicebag (the snatchel, not the Fireball). 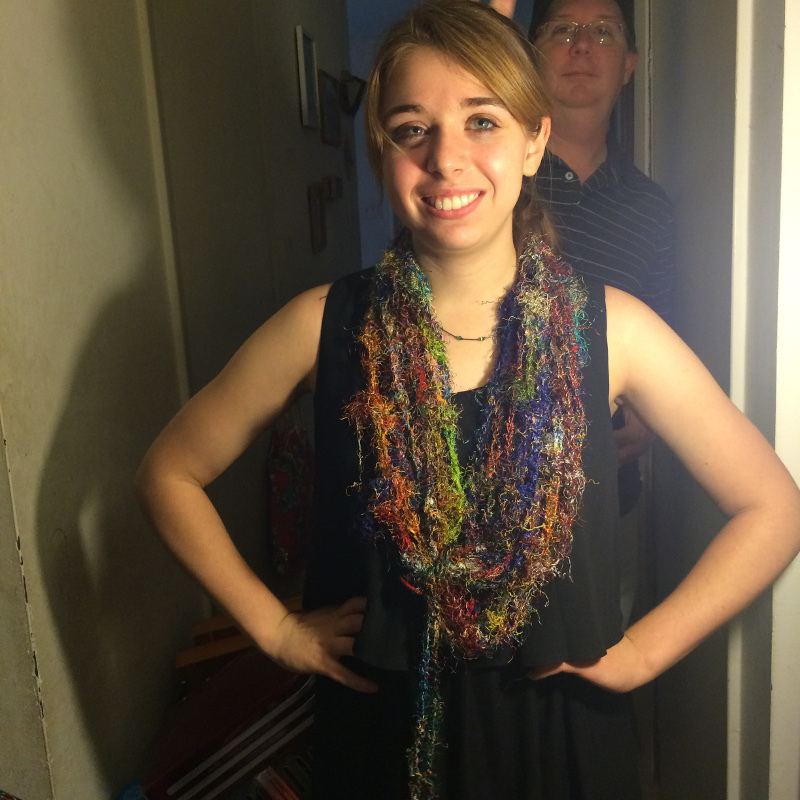 I finished the second Artful Infinity scarf, and have given it to my younger daughter. She absolutely rocks it (as she does everything she wears). 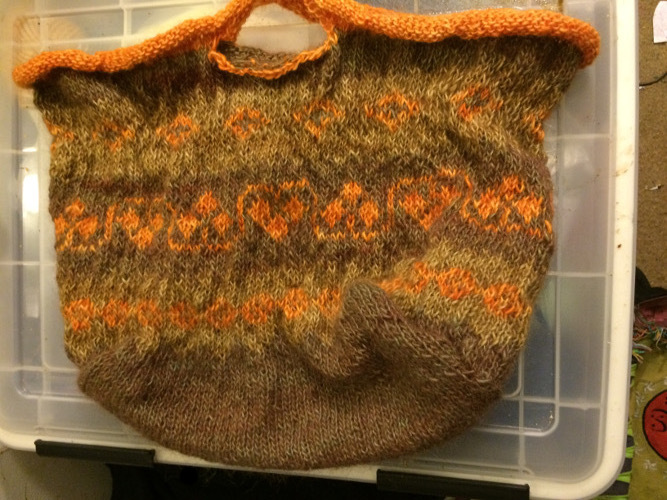 The not so goatty bag is coming along nicely (if slowly). It really doesn’t look much different than the last picture I posted of it, but I’m having fun playing mix and match with the motifs. My only other WiP right now is the Mont Royal socks. I’m playing around with my usual asymmetric toes. Rather than my usual plan of increasing on both sides for the first few, then switching to only increasing on the outside of the socks, I’ve staggered it. 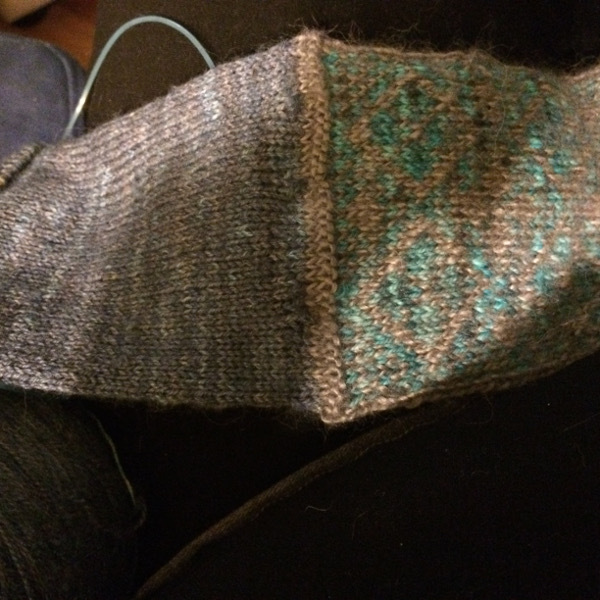 So the first few increases are on both sides of the sock, then the next few increases alternate between increasing on both sides and increasing on the outside only, then the final few are on the outside only. I think it looks fine, and the CoBaSi yarn gives it a very crisp feel. You can’t really tell from the picture, but I’ve just begun the chart. This is my first project using my new Knit PIcks magnetic chart board, and it will be the first one I use my new KnitPicks sock blockers with as well. 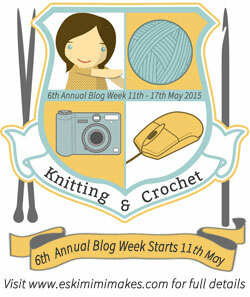 I didn’t win the Red Heart giveaway from Happily Hooked, or the Yarn Crush box from the Dainty Fawn blog. No new giveaways today.